The application logs option on the user interface displays SNI hostname information along with other SSL related information. The SNI information in the application logs provide more insight about the incoming requests and also help in troubleshooting various issues. When the child virtual service sees an SSL connection with SNI header, the hostname in the SNI header is recorded in the application log along with the SSL version, PFS, and cipher related information. 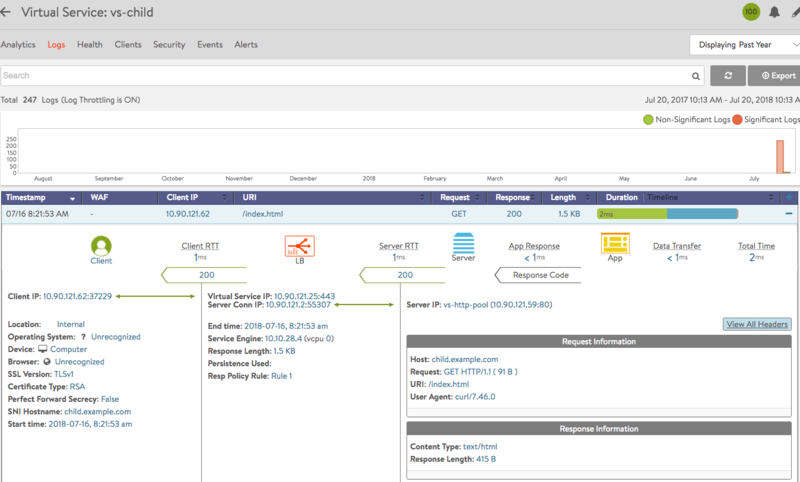 To check for SNI-enabled virtual service related logs, navigate to Applications > Virtual Service, select the desired virtual service, and navigate to Logs.